Accompanying a major exhibition at The Courtauld Gallery, this catalogue explores a remarkable and unprecedented series of paintings by Peter Lanyon (1918-1964), one of Britain's most important and original post-War artists. Lanyon sought to create a new vision of landscape painting for the modern era. He considered himself to be extending the landscape traditions of earlier artists, in particular Turner, whom he admired greatly. Lanyon strove to find a language of painting that expressed his direct experience of the landscape which might also probe questions about the nature of our existence within the world. During the 1950s, he produced radical, near-abstract paintings of the tough coastal landscape of his native West Cornwall. He was fuelled by a desire to experience that landscape as completely as possible. In the summer of 1956, Lanyon was walking across a high cliff top when he looked up, saw three gliders soaring overhead and realised that this was the experience he desired. He began gliding seriously in 1959 and went solo for the first time in 1960, clocking up many flying hours over the next few years. Freed from a land-bound perspective, Lanyon poured his new gliding experiences into his art, producing paintings that offer a thrilling sense of his encounters with the land, sea and air, collapsing the multiple perspectives of his flights into each new composition. The paintings are also profoundly shaped by Lanyon's new-found glider pilot's knowledge of the character of the air - its different movements, textures and forces, as well as the dangers and life-lines that it presents as one navigates through the thermals and up-draughts that are the invisible map essential for the glider's survival in the sky. Lanyon's gliding paintings stand as a unique achievement of twentieth century art, reinventing and furthering the tradition of landscape painting in ways that can also be seen to engage deeply with the pressing existentialist concerns of the post-War world. This remarkable project was cut short by Lanyon's unexpected death in August 1964 whilst in hospital recovering from a gliding accident. 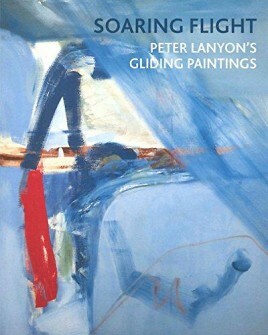 Accompanying the first ever exhibition devoted to Lanyon's gliding paintings, this book will offer a pioneering account of this important but overlooked body of work, bringing together around fifteen major paintings from public and private collections internationally, alongside a small group of constructions. Toby Treves is author of the forthcoming Lanyon catalogue raisonné. Margaret Garlake is a leading scholar of Lanyon's work. Sam Smiles is Associate Professor of Art History and Visual Culture at the University of Exeter. Barnaby Wright is The Courtauld's Daniel Katz Curator of 20th Century Art.